I need to take a break from blogging. It is the time for me to hit the road again. Every summer I travel to far away places with my kids. I like to show them the world they live in and experience things that they can’t at school. Last summer we traveled Europe, this year? Well, I like to keep it as secret. But I will share with you all the highlights when I come back. I won’t be able to use my toys for a while; the kitchen stuff and my i-mac desktop that had been glued to my eyes. Instead I will be walking on the exotic country road far far away. Very excited. 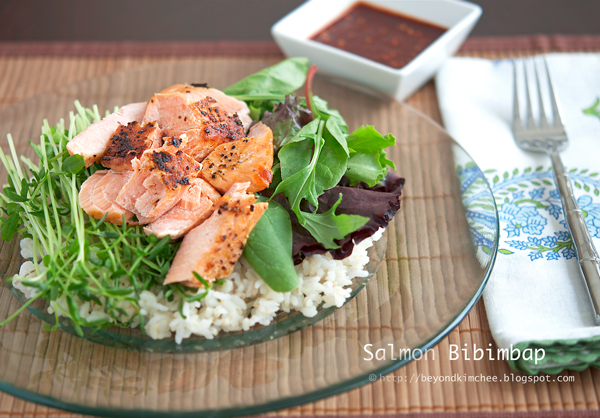 So, the recipe I chose to end the first half of year 2011 blogging is; The Salmon Bibimbap! It only takes about 15 minutes or less to put all together if you have rice ready to go. And it is quite healthy as you can tell. Don’t like fish? No problem. You can easily substitute with grilled chicken or steak. If you are a very adventurous person, try with fresh raw salmon (sushi quality fresh) or smoked salmon. 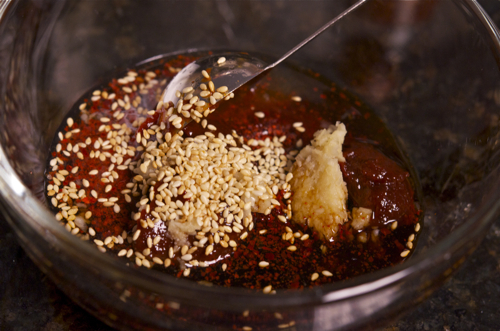 A trick to enjoy this dish is not to over mix everything harshly like traditional bibimbap. You don’t want to bruise the tender greens. Almost like salad, just briefly toss together and enjoy every bite of it. 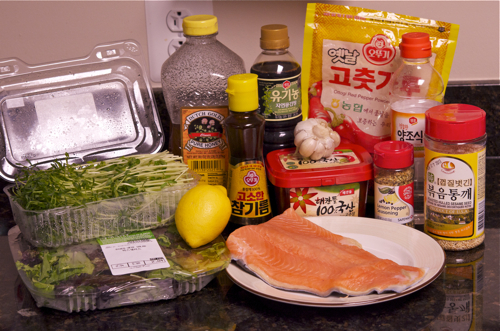 Salmon fillet, green salad mix, pea sprouts or alfalfa, lemon, honey, sesame oil soy sauce, Korean chili flakes, chili paste, garlic, lemon pepper, vinegar, and sesame seeds. 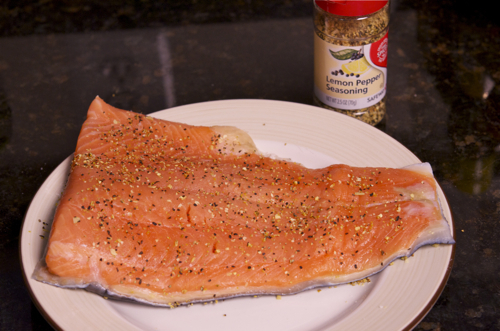 Season the salmon fillet with salt and lemon pepper. Be generous. Saute the salmon about 4-5 minutes on each side. 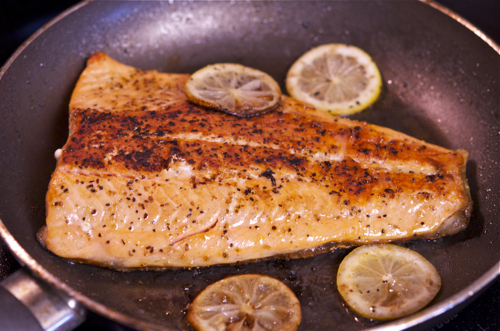 Adding a few lemon slices will help to cut any fish smell and keep the fish moist and tender. While your salmon is cooking, prepare the dressing. 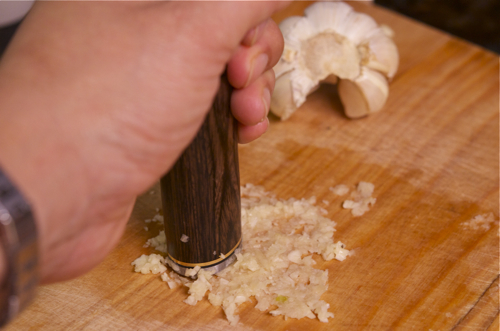 Smash, mince, chop, press, or use whatever method, make sure your garlic gets finely crushed. Add the other ingredients and mix very well. Set aside. Flake your salmon with a folk into big bite size chunks. 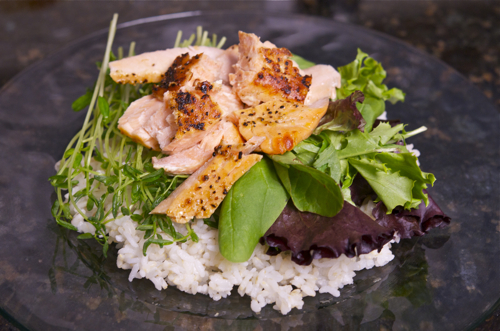 In a shallow bowl or plate, spread brown rice, salad greens, and sprouts. Top with salmon chunks, drizzle the dressing over and you are ready to go. A good simple miso soup on the side would be a nice touch for this meal. but I would like to thank all of you for all the supports and comments. It’s been a wonderful journey and I enjoyed making friends through food. Thank you for putting up with my poor Anglish (English). According to my piano man, I can spell “schizophrenia” right, but “egg york (yolk)” wrong. Have a fun cooking up good food. I’ll be back when it’s time to say goodbye to the summer. 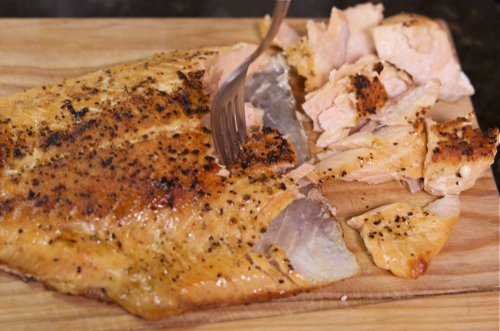 Season salmon fillet with salt and lemon pepper. Heat oil in a pan over medium heat and saute salmon until cooked through, about 3-5 minutes each side. Let the fish rest for a few minutes and flake with a fork into big bite sizes. Meanwhile make dressing by mixing all the ingredients. 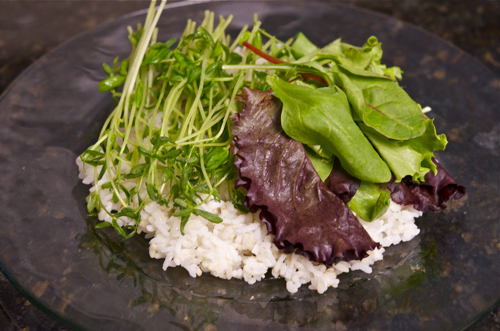 In a shallow bowl or a plate, place some rice and scatter greens and sprouts. Top with salmon, drizzle with the dressing. To serve toss everything briefly and enjoy. Hm, looks fantastic! Thanks for posting! Have a great trip and don't forget to come back and share all the good stuff you saw and ate with us! I just discovered your blog and I really enjoying reading it. So sad to hear that you'll be taking a break and I'll miss you. I, too, agree with you that the world is there for you to discover and traveling is the best way to learn. You're very fortunate to be able to do so and for an extended trip at that! I try to take my kids out of the country at least once a year but due to the economy, we couldn't do it this year. English is my second language too and I think your English is great! You tell great stories and convey your messages clearly. I hope you have a great trip and I look forward to your return. Have a great trip! Can't wait for the photos and more recipes when you return. We LOVE Korean yesterday!! Just yesterday we went to China town in Atlanta had some yummy Korean! 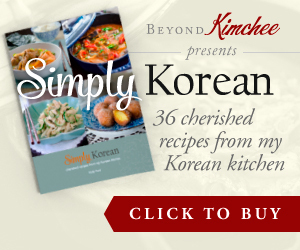 I live next to a Super H Mart and I am dying for some recipes!! We saw you on food gawker! We just started following you cannot wait for more to come! What a great post! Just came across your blog and fell in love with it immediately! You have amazing sense of style!! 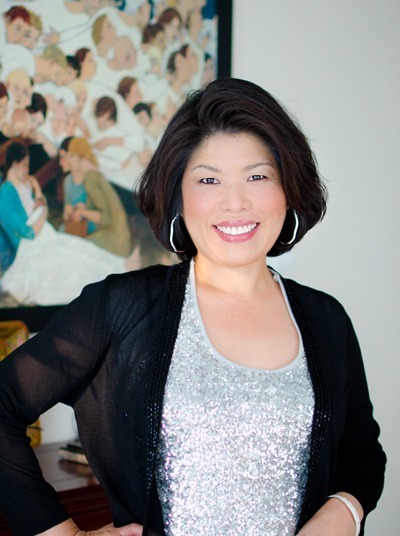 !Check out my blog and follow if you like it, I will do the same in return!www.fullclosetbutnothingtowear.blogspot.comHope to see you soon! Amazing recipe, i want to try it! Have a wonderful trip with your family! make sure you take tons of pictures...we would love to see! Great recipe. Pictures are so informative - good work! Enjoy your time away from the blog, but know that you'll be missed. Thanks for your efforts. I just found your site, so sorry to see you go, but I love what you plan to do. Hope to see you in the future. hi, finished your vacation? when will you be back, we all miss you here!! So delicious! My boyfriend and I are devouring it right now. Instead of cooking the salmon, I baked it, 450 degrees for 15 min with some salt and pepper sprinkled on top. The sauce was so delicious and this was so healthy! As we mixed it, the veggies shrunk and I was able to fit lots of salad leaves in! I made this recently and it was delicious! 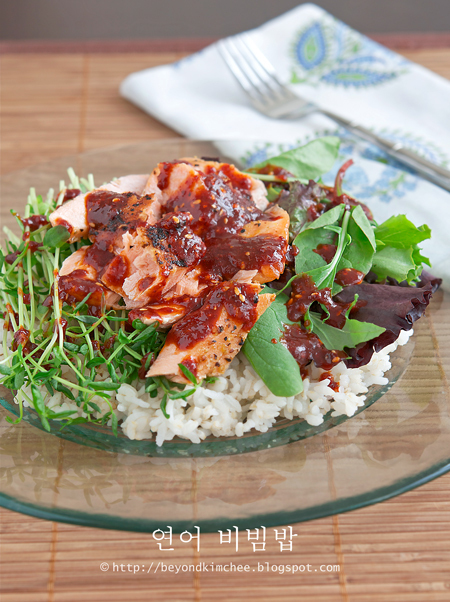 I love salmon, so any new wasy of serving it are welcome in my book. Couldn't find Korean chili flakes so used Japanese instead. Thanks for sharing this recipe!